A swale catches runoff and lets it sink into the soil. We who live in cities and towns, and we who eat food grown on industrial farms, depend on imported water for daily survival. Our water and the water that grows our food travels hundreds of miles to reach us. It is powered by mountain-leveling coal, mega-dam hydro-power, and deadly nuclear power. The infrastructures that bring us this water costs billions of dollars in public tax money and household utility bills. Harvesting rainwater can reduce our need–and demand–for water transport systems that threaten the health of the water cycle and our local environments. Ironically, water use is often highest in the places where rain falls the least. But whether you live in the damp Pacific Northwest, the arid Mojave desert, the thunderstorm Midwest, or beyond, we almost all depend on problematic water infrastructures. 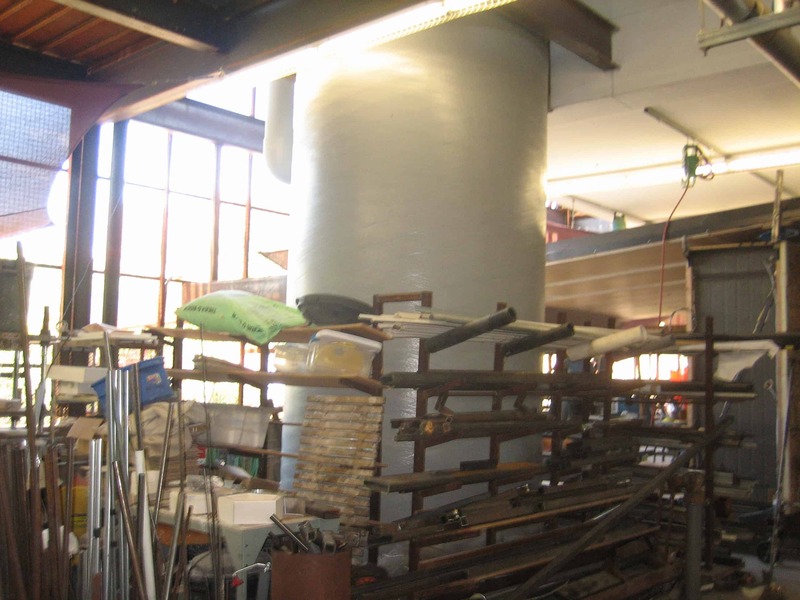 An 11,000 gallon (3 story) cistern collects rainwater at the University of Arizona. 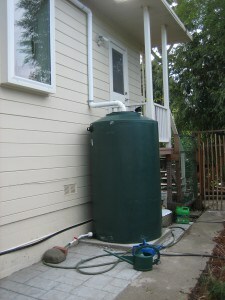 Rainwater harvesting is one strategy in the greater scheme of reducing domestic water use. By harvesting rainwater we can utilize rainwater falling onto our homes and landscapes for beneficial purposes, while preventing it from becoming stormwater pollution as it runs off into the stormdrain. Rainwater harvesting inspires other practices that bring us into greater sustainability. Growing plants that provide summer shade to cool our homes reduces energy use; increasing home food production reduces demand for wasteful water use in industrial fields. Above all, rainwater harvesting increases quality of life: ours, and that of life worldwide. 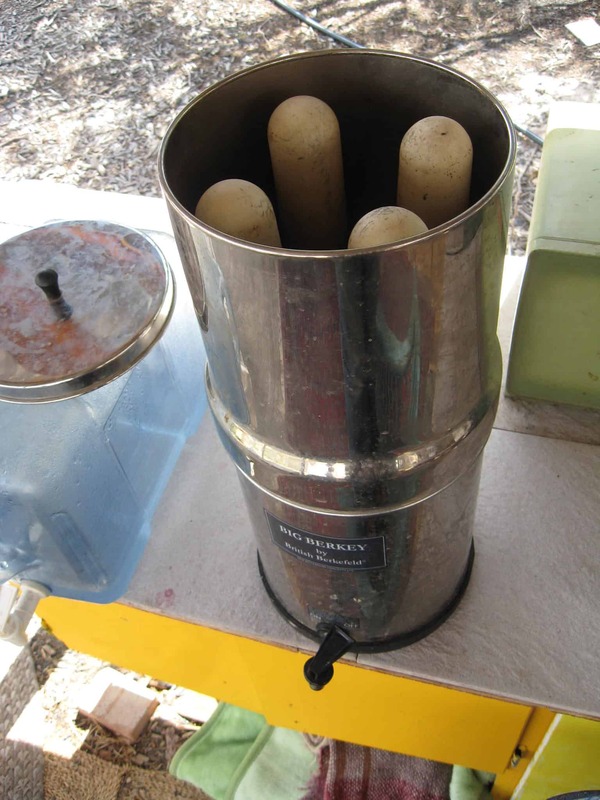 In arid climates and places with salty irrigation water rainwater flushes salts and chemicals out, allowing for long-term health and soil vitality. On any house lot, there are three potential sources for harvesting the rain: Direct rainfall, street harvesting, and roof harvesting. The easiest rainwater source is that which falls on the yard. Proper placement of plants, trees, and water sources can turn the site into a water efficient system. Shape the surface of the soil to slow down runoff, raise paths and patios, and sink all planting areas to capture the flow. Choose plants–primarily natives–that can absorb and hold water in their root systems, or pass it down to the water table. This way, rainwater doesn’t run off into the street, where it would be swept away with motor oil, into the sewer system or discharged directly into a local waterway. Installing a simple rain garden can prevent runoff from most yards. A rain garden is a sunken planting bed, designed to receive runoff from roofs and hardscape, to slowly sink the water into the ground. Planted with locally adapted plants, a rain garden creates a lovely landscape feature without requiring supplemental irrigation. Rain gardens have been proven to reduce flooding, reduce water pollution, and beautify landscapes in homes across the country. 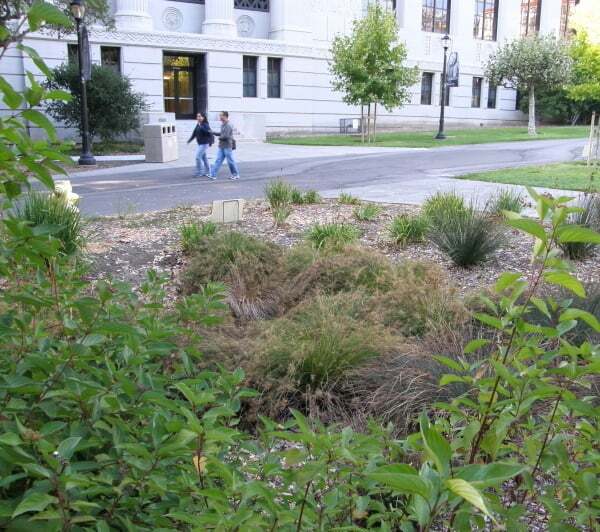 Many areas offer incentives and free education to support rain garden installation. 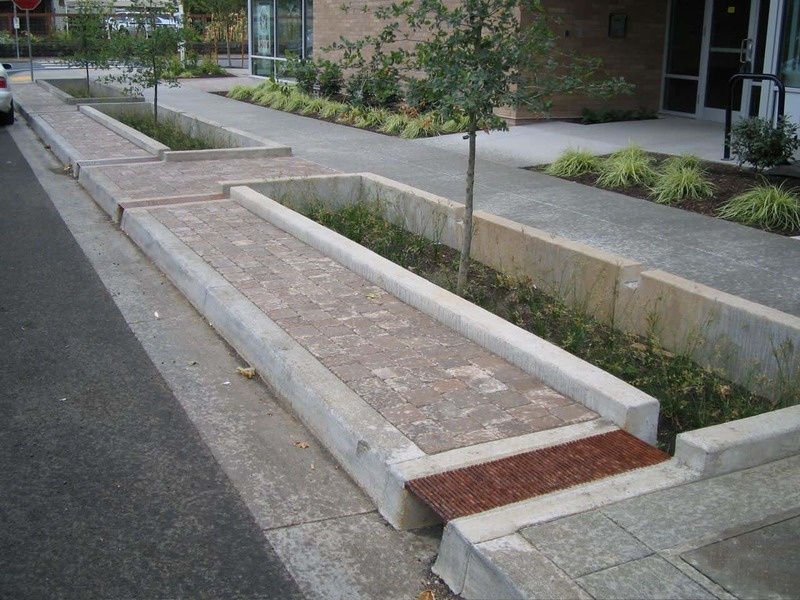 See the resources page for more info on how to design and construct rain gardens. The second source of rainwater is the street. Streets aren’t flat; they are typically graded so that water flows to the curb, down the block to a gutter, into the storm drain. In cities like San Francisco and Portland, storm drains are connected to the sewer treatment plant, and heavy rains cause the sewer plant to overflow raw and partially treated sewer into the bay or river. Other cities connect storm drains to underground creeks, and the polluted water runs straight into the bay or nearby river. 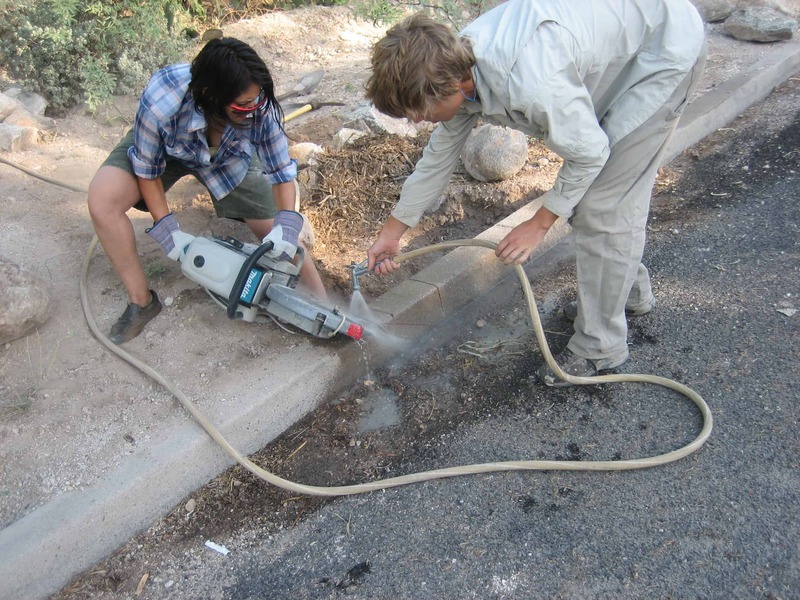 By cutting curbs and digging sunken basins into the “right-of way” or “parking strip” area of the sidewalk, you can turn street rainwater from a problem to a resource. Diverted rain that falls on streets can nourish plants, protect creeks, and contribute to cleaner cities. Storm water runoff flows into basin after the curb was cut. 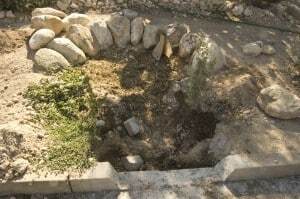 The third source of rainwater is the roof. 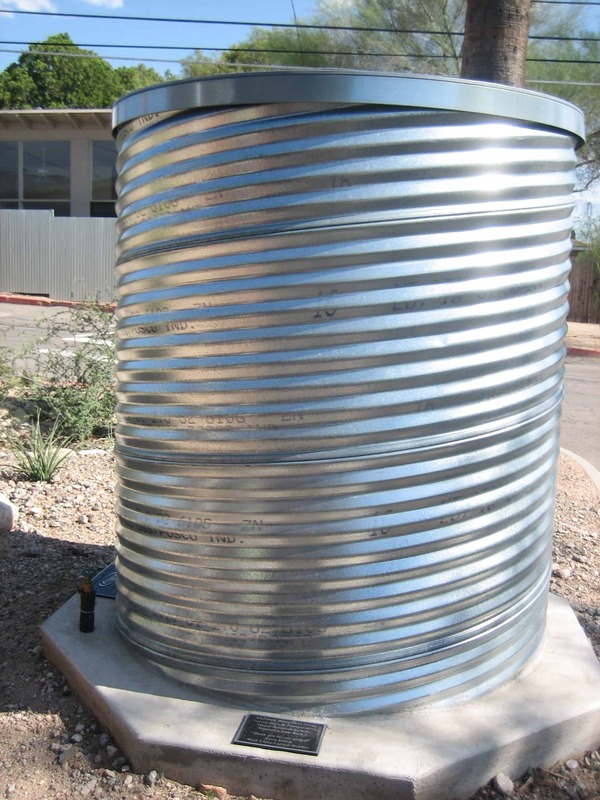 Even in areas with low rainfall there is an enormous potential for harvesting rainwater. For example, the roof a 1,000 square foot house can collect around 600 gallons per ONE inch of rain! In an average year with 12 inches of rain in Los Angeles, that small roof could collect 7,200 gallons. 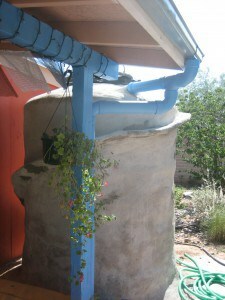 A water catchment system for roof rainwater is simple, and can store water for outdoor irrigation. Gutters: Roof water gathers in the gutters and runs to a pipe towards the tank. Screen: The rainwater goes through a screen to remove leaves and debris, and then funnels into the top of the covered tank. Storage: The tank is dark, to prevent algae from growing, and screened, to prevent mosquitoes from entering. 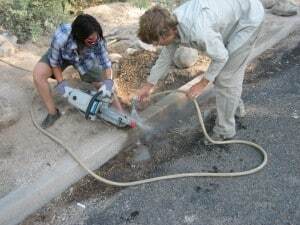 Irrigation: A hose attachment is located near the bottom for irrigation. Larger systems can include gravity drip irrigation, or a pump for drip irrigation. Pumps/Filters: Indoor systems, either non-potable for toilet flushing, or potable whole-house systems, typically include pumps and filtration. 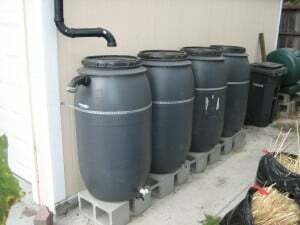 Rain barrels are a popular way to begin rainwater harvesting, especially in urban areas; they are low cost, and can be installed along houses, under decks, or in other unused spaces. 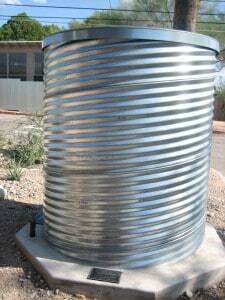 There is a huge range of options for rainwater storage tanks. They can be made from plastic, ferrocement, metal, or fiberglass, ranging in size from 50 gallons to tens of thousands of gallons. See the resources page for information on construction, cold climate considerations, and other useful information. Using rainwater inside the home maximizes water savings, especially in Mediterranean climates where there’s no outdoor irrigation need during the wet season. 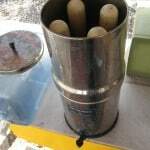 All over the world rainwater is used for washing, cleaning, and drinking, without filters or disinfection. However, in the U.S. and Canada most potable systems do include filtration and disinfection. Another option for homes with another water supply is to use rainwater for non-potable indoor uses, such as toilet flushing and laundry. These systems are typically easier to get permitted, cost less, and don’t require as much treatment as whole-house potable water systems. In general, indoor rainwater systems that supply water to a typical modern house are more complex than irrigation systems because the water is pressurized, filtered, and disinfected. However, simple, gravity fed rainwater systems can be built and low cost filters used for drinking, like slow sand filters or clay filters. See the resource page for more information. A sumo-wrestling arena in Tokyo, Japan, stores rainwater in a large underground tank for toilet flushing. The Frankfurt Airport in Germany collects rainwater for toilet flushing and irrigation. Eggleton Services, a non-profit in Norfolk, Virgina, uses rainwater from the roof of a laundry facility in the washing machines. Read about rainwater harvesting projects from around the world here. See more US examples from the American Rain Catchment Systems Association (ARCSA) here.